Happy Tuesday, awesome blog readers. Today’s post is a bit different than normal (and I do know that I say that a lot). 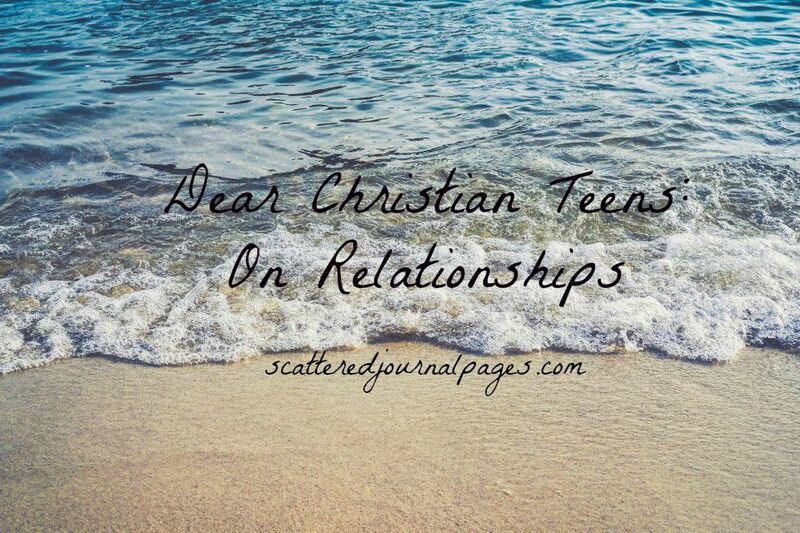 However, some things have been on my heart recently about teens and relationships. This is a shorter post today, because today is my first day back to school and last night I was trying to get to bed early. A near-impossible feat on a blognight, I know (and I just made that term up now). But nevertheless, the points still stand. And I’d like to share them with you. I mean, this is a teen blog, after all. So, here goes. Dear Christian Teens #1. In which Amanda talks about romantic relationships. And dating. And other things she has never quite experienced, but probably will someday. This is written like three separate letters. (Have you noticed my obsession with letters yet?) It’s rather choppy, I know, and I’m sorry. But I wanted to alternate. Because alternating is fun. Dating is not a sport. It’s not “marital practice”. We should focus on the final goal when we are considering a romantic relationship – marriage – for our hearts are much too precious to be thrown around like bowling balls. Value the modest girls. The ones who care about God’s opinion over yours. Beauty fades. Dignity stays. Value the gentlemen, not the bad boys. Humility and selflessness are to be treasured, not thrown away. Choose to love someone who loves God over you. If your eyes are fixed on others and not God, you won’t find The One God has for you. You will find them by focusing on Him. True beauty comes from the inside out. Not the other way around. Don’t compromise your purity to be loved. Rather, prove that you’re worth it by staying pure. Love your family. Treat them with respect and kindness. How else do you expect to be ready for having a family of your own? Your walk with God is invaluably important; you are to be a spiritual leader. You don’t have to be a pastor, but God calls you to be the head of your family and to lead them in truth. Never compromise that. You are God’s beautiful creation, and not an object. Don’t make people think you are by dressing and acting without decency and dignity. Never forget that who you are is defined by what Christ has done for you, and you do not have to prove anything. God must be the center of your life. If He is not, especially in terms of relationships, your life will not be solidly built. Form your life around your relationship with God, and let Him lead you. Marriage will not always be glamorous like in the movies. It won’t be all butterflies and rainbows. But love, and the most beautiful kind at that, is a love that is committed. Not just when it’s easy, but always. I’m sorry if my thoughts are incoherent. But I guess what I’m trying to (indirectly) say through these mini-letters is this. God should ultimately be the one guiding our relationships, not us alone. We all are precious and valuable, and none of us should ever see others as objects (despite what the culture says). “Old-fashioned” virtues like modestly, decency, humility, and selflessness are BEAUTIFUL. To be treasured, and valued and appreciated. When commitment to God and to each other is the center of a romantic relationship, it will be much stronger. Seriously. God isn’t to be put on the back burner, people. And lastly? Dating and relationships are to be taken seriously. As are our relationships with our families. Because really, the ultimate goal is to raise up families to love God and know Jesus. We can’t listen to the culture when it comes to such important matters. Marriage is beautiful, people. Not to be corrupted. We were made for each other, God designed it that way. Let’s be serious. Let’s focus on God first before others, and treat everyone like Jesus would. Great post Amanda! You are right, I am with you! If I never get a girlfriend I want one like you said. I think at 15 I am way to young I need to wait until I;m at least 18! I agree with you that dating is not a sport, the only reason I would chose to date a girl would be if I could see her as maybe being my wife one! Even if you do date one that could be your wife one day it might not still work out! Yes, exactly. I’d rather wait until I’m at a marriageable age, because I don’t want things to get too complicated and messy. What’s the point before then? Like you said, I would much rather wait for someone who I could potentially marry than just “date around” and break my heart and the other person’s! 😀 Thanks for commenting! I’m with you, Amanda!!! Great post!! Thank you, Cassie!! 😀 And thank you for commenting! Yes, yes, yes. I agree with everything. People shouldn’t get into romantic relationships unless they’re ready for it to lead to marriage. Girls shouldn’t throw purity to the wind to make guys notice them. Guys should be ready to be leaders before they pursue a relationship. God is the One who fulfills us, we shouldn’t look for that in a spouse. God’s love is sufficient, a spouse’s love is extra. These are some of the reasons I’m not in a relationship, even though I technically AM of a marriageable age. I don’t want to do it like the world. I don’t want to force it. I don’t want to break other people’s hearts and my own by getting in a relationship with some other girl’s future husband. I want to wait on God to reveal it to me. I want the guy to pursue me, not the other way around, because it’s his job, not mine. And I want to be content in God, because if I’m not, discontent will just continue into marriage. Yes, exactly Morgan. 🙂 I love your thoughts on this! And yeah, I read a blog post a little while ago that said something about seeing ourselves as married to our future spouse even before we know who they are. That definitely keeps purity in perspective. And also, that we shouldn’t date excessively, because it only takes one person to be The One. And you’re so right about the discontentment thing. Whether we are content or not doesn’t have anything to do with our “status”! Thank you for your comment. Very good post – and I agree! A lot of teens get into relationships without really analyzing what dating is for. Dating isn’t for a social status, or for making yourself popular. Dating is for finding a soul-mate, and should be special 🙂 Keep up the good work, Amanda! Thanks, Ellie! Exactly my point. Why get your heart broken over someone who’s not going to spend the rest of their life with you? Thanks again! I’m glad you liked it. I agree with this 100%! Dating is supposed to be serious, for the purpose of marriage. I don’t believe that people should date unless they are ready to marry. Thank you, Alea! Yep, it does seem like more sensible of a plan to wait until we’re ready, both age wise and maturity wise. Sadly, most people don’t see it that way. And thank you again! Yes, I hope I can get my act together and do it! Haha. I do have Saturday’s post planned out, and it’s a DCT, so it’s definitely possible that I’ll continue with it. Thanks for the encouragement! Not related to the post: How do you pronounce your last name? Haha. Yay! And totally. It would be so much easier if we weren’t so obsessed with ourselves and caught up in fluffy nothingness. I 100% agree with this post. I think another thing you should’ve mentioned was this (or perhaps you did but I missed it) is that when dating, you should always try dating someone who shares your core values and your Christian faith:and be frank about them! Don’t hide them or brush them aside! I recently tried “dating” without really trying it (it’s a complicated thing gah). Basically this guy I knew had been feeling lonely recently and tried to “use” me to fill that lonely void. I, just thinking we should be friends first (for I didn’t at all see me dating him, having just watched in Confirmation class the sanctity of marriage and why dating should be you looking for who you would want to marry), taking things slow and developing our knowledge of one another, rather than going into the kissing and touching quite a few 15 year old guys want. I wasn’t that dumb…but I was still dumb. We weren’t AT ALL compatible, and he was on the verge of atheism anyway..you know, those churchgoers that don’t take the churchgoing seriously…he let his doubt overpower his trust in the Lord. I brushed those things aside, and the fact we really had nothing in common. I knew we were way too young to be dating…and so I wasn’t keen on the idea. But I let him get close (and I was an idiot)..we only went as far as my head on his shoulder in the movies and a lot of hand holding. It’s embarrassing. and miserable for me..we parted ways less than a month later. We just had no business being together. Guys and girls: be frank with one another. Don’t be afraid to voice what you believe in (without oppressing it on others of course). Make sure you both are on the same page! Oh, definitely. We need to be equally yoked with the person that we will potentially marry, or it all just goes downhill! I’m sorry to hear about your story. That must have been really hard! Keep trusting God, and He will work it all out for good. 😉 Thanks for reading! I’m brazilian (so sorry my mistakes, I speak Portuguese, and I’m learning English ^^) and I found your blog in The Rebelution. Here in Brazil, we’ve a campaign: Eu Escolhi Esperar (I Choose Waiting), and any people (like Fabiola Melo) that saying about relationships, and they help us (christian teens and teenagers) choosing the God’s will to our romantic life. Eu Escolhi Esperar sounds great. It’s very helpful to have people around you helping you do what’s best. Thanks for coming to my blog! Your English is great. Hmmm… Can I translate this post to Portuguese and post in my blog (with credits and link of Scattered Journal Pages)? Yes, you may! 😉 Thanks for asking. Love this! Totally agree on everything you said. Personally, I haven’t started dating but some of my friends have. Through seeing them break up and get back together and date other guys, it’s really eye opening to see that because they or the partner hasn’t put God first in their lives, the relationship just didn’t work out. At youth we often talk about relationships but I think the away you put it helped me and I could really relate it with my life even though I haven’t started dating yet. Hi Minky! Thanks for your comment! Yeah, it’s really sad to see so many broken hearts over relationships that are premature or unnecessary. Dating shouldn’t just be a game! 🙂 It should be in pursuit of marriage, and with God always at the center. It’s sad when that gets messed up. I’m so encouraged by what you said about my post! God bless.